The minor pyramid at the site. Photo by Daniel Miriam [CC BY-SA 3.0], via Wikimedia Commons. The larger pyramid is 38 feet in height (11 1/2 meters tall),2 and is partially collapsed. It features a monumental two-tiered staircase on its western side. From a check of alignments of this site on SunCalc.net, the stairway of the main pyramid appears to be aligned to the winter solstice sunrise, such that you would see the sun rise from behind the pyramid. Note: this alignment remains to be verified on the ground. SunCalc shows a likely winter solstice sunrise alignment at the gateway, indicated by the yellow line. Image created with SunCalc, using imagery © 2018 DigitalGlobe, map data © 2018 Google, INEGI. 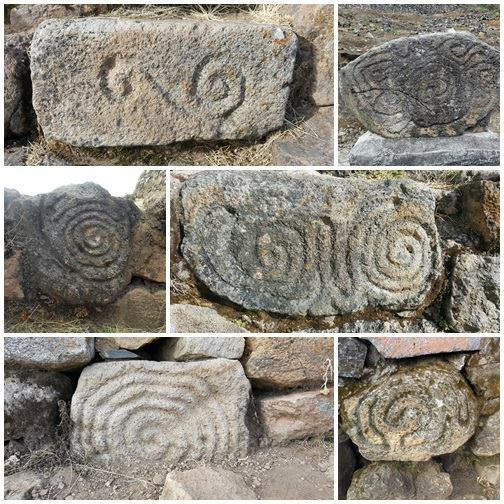 Interestingly, the site contains a myriad of petroglyph stones embedded into the pyramids themselves, as well as in the surroundings of the site depicting many symbols of the ancient Religion of the Sun, such as spirals, labyrinths, concentric ring suns, tortoises, etc. “Our Visit to the Pyramids of San Felipe de los Alzati.” Frame To Frame – Bob and Jean. February 21, 2017. Accessed January 06, 2018. https://frametoframe.ca/2015/02/visit-pyramids-of-san-felipe-de-los-alzati-mexico/. Standish, Peter. The states of Mexico: a reference guide to history and culture. (Westport, CT: Greenwood Press, 2009), p. 225. This looks like an amazing, massive and beautiful site, one I don’t know very much about. Thanks for posting it Jenny. Looking forward to learning more about it. The appearance of these pyramids immediately reminded me of similar structures you’ve written about on Mauritius (https://www.spiritualsun.com/spiritual-sites/stepped-pyramids-in-mauritius-align-to-the-sun) and the Azores (https://www.spiritualsun.com/spiritual-sites/pyramids-in-the-azores-align-to-summer-solstice). The tiered stepped structure with a monumental staircase is reminiscent of Mesopotamian Ziggurats as well, although those are mud brick instead of stone. Looking at a map one could visualize how a pyramid-making culture might have diffused west in pre-historic times, eventually reaching Mexico and leaving this legacy (as their own legends speak of). Especially as explorers like Thor Heyerdahl have demonstrated that the journey across the Atlantic was very possible for ancient peoples. Yes, I totally agree, Justin. The similarities in construction and design struck me as interesting as well. Yes having explored some of his work recently, I was really blown away by the depth and breadth of Thor Heyerdahl’s contributions. His curiosity, range of interests, willingness to question conventional wisdom, and the sheer bravery demonstrated in his voyages are all remarkable to say the least. We need more open-minded archaeo-explorers like him. Thanks Jenny. There are just so many ancient places aligned to the sun and, it seems, more to be uncovered yet, and they all seem to have similar symbols. What amazing ancient civilisations existed in these ancient times. They had so much knowledge, both spiritually and architecturally. Judging by the stairs and height, they must also have been very fit :o) ! Incredible place! Watching that video I felt transported there for a moment. It struck me just how steep those steps are … they didn’t build them to be easy! I’ve just been re-reading The Flight of the Feathered Serpent, and in it it’s mentioned that parts of Mexico are the most archeologically rich areas on the continent. Must have been an absolutely incredible place once upon a time, a place where real spirituality was practised among people. It’s amazing to think we still have the monuments of those people today. Hi Ella. I’ve been reading some books by Thor Heyerdahl recently where he explores the ancient seafaring practices of the lost civilization of the sun. In his books The Ra Expedition and The Maldive Mystery he demonstrated how you can sail across the Atlantic Ocean in traditional ancient boats simply by making use of the ocean currents, and that regardless of whether you set off from Morocco (where he believes ancient people of the Religion of the Sun set off from — the port of Lixus) or from the southern tip of Africa, you’re most likely to end up in the Gulf of Mexico because that’s where the ocean currents will pull you. Likewise, he explained that ancient seafarers could have sailed in the same manner from the Indian Ocean, around the tip of Africa, and from there they would also end up in the Gulf of Mexico. I think that might be the explanation for why Mexico and central America are so abundant in archeological remains, and appear to contain influences from many cultures. Sounds like Mexico was like an port / access point to the rest of the Americas. That’s so curious. Like a maritime version of ‘all roads lead to Rome’… sort of. Makes sense as to why the region was so rich in ancient solar sites. But it also makes me wonder about the meta-physical forces behind it. Why would these ocean currents from very different parts of the world pull boats straight to this spot – is it energetically powerful somehow? I always feel this warm magical sense coming from these mesoamerican ancient sites, they somehow really compel one to visit there. I would love to go one day to explore pyramids and temples like this in those regions! Interesting to hear about the petroglyphs carved into the sides of the pyramids… I wonder if there is more meaning to them than is known currently, like how they were used? I suspect some had more uses to them than merely being decorative. There must be so much more history to be revealed about such cultures and how they practiced spirituality in their lives. That fly in drone video makes those platforms look like really special places to have ceremonies! One can only imagine. Yep, that’s just what I was thinking as well (from the drone video). What an awesome place! I was thinking the same thing too Karim… would love to go and explore this one, and the drone footage just really conveys a sense of the scale and how magical it would be to explore. I was also wondering about the petroglyphs, why they might be located in the particular places they are around the structures. It would be interesting gather more information about them first hand from the ground, seeing how they relate to the site as a whole, since you can only tell so much from photos. Thanks, Jenny. How surprising they found the symbol of yin and yang there! I’ve always related it only with the far east cultures. I think if we consider the hill in front of this pyramid, it might have a perfect alignment with the winter solstice sunrise. Because of the mountainous landscape of this site I checked it on a topographical map of the area (http://onlinetopomaps.net/). It seems like a potential piece of the puzzle here is that winter solstice sunset alignment may actually be in the direction of the valley towards the city called Toluca (you have to zoom out a lot to see it). If this is the case this pyramid may be one of the best places for local people to see winter solstice sunset. That’s really interesting, Aleks. Thanks for sharing. I was wondering how the mountainous landscape would affect the scene. Nice fine Jenny. I wonder if this is part of a larger complex of structures that include a summer solstice aligned pyramid. It would make sense if one was building a solar spiritual location to try and cater for different ceremonies unless they had specific locations dedicated to certain times of the year.